McGill Law is committed to recruiting and supporting Indigenous students and we welcome dialogue with prospective BCL/LLB applicants. First Nations, Inuit and Métis persons are strongly encouraged to apply to the Faculty of Law, and are invited to self-identify on their application form. We do not have a separate applicant category for Indigenous students or applicants from other underrepresented groups in view of our overall holistic process. However, self-identification allows McGill to inform Indigenous students of specific services and funding opportunities and to assess our progress in the recruitment and retention of Indigenous students. Self-identification includes 'Status,' 'Treaty,' 'Registered', 'Non-Status,' and 'Non-Registered' Indigenous persons. We acknowledge that our bilingualism admission requirement may represent an added challenge for some Indigenous applicants for whom English or French may be a third language, and potentially perceived as a colonizing influence. We do not wish Indigenous candidates to exclude themselves from applying on linguistic grounds – and we encourage you to speak with us if you have concerns on this point. Financial support is available to admitted Indigenous candidates who wish to improve their abilities in English or French before starting the program and to continue to address a relative weakness in English or French during legal studies here. This program is generously supported by the McCarthy Tétrault Fund for Language Training. Please contact us to find out more! McGill has established a funding program for Indigenous students, made possible in part by Indspire, an Indigenous-led registered charity that invests in the education of Indigenous peoples of Canada. In addition to self-identifying on the application form, Indigenous applicants are encouraged to upload one additional supporting document. This document should be a separate letter, in addition to the Personal Statement, and is meant to allow you to elaborate on your Indigenous identity in relation to your candidacy. This document may address any systemic barriers you have faced as an Indigenous person, or how your identification with, and connection to your Indigenous community affected your educational path and goals. You may also include, as part of that document, a letter of support from a representative within your community. This additional document will allow the Admissions Committee to incorporate relevant context in the holistic admission evaluation process and to take into consideration the educational experiences particular to members of an Indigenous community. McGill offers students the opportunity to study and complete research with a wide range of legal scholars in English and French. The Faculty is host to a vibrant Indigenous Law Students’ Association and the Centre for Human Rights and Legal Pluralism's Aboriginal Human Rights Initiatives. McGill also gives students the possibility to acquire practical experience working at the Legal Clinic at Kahnawake, to participate in the Faculty's outreach program L.E.X. (Law-Éducation-Connexion) with Kahnawake Survival School, as well as the chance to participate in the national Kawaskimhon Moot or to complete at McGill a Minor in Indigenous Studies. Students can partake in a term-away at the Indigenous Peoples and Policies Program at the University of Arizona, and the Intensive Program in Aboriginal Lands, Resources and Governments at Osgoode Hall Law School. Indigenous students may be eligible for numerous sources of financial support. The Wiyasiwewin Mikiwahp Native Law Centre (NLC) at the University of Saskatchewan offers an eight-week Summer Program that is designed to prepare students for the challenges and rigours of law school and to facilitate a smoother transition into the law school environment. We encourage all incoming Indigenous students to consider taking this course before beginning their legal studies. The NLC Summer Program Property Law course studies the Common Law of property and Aboriginal property and as such it is not accepted as a property law credit in the McGill program where our course covers Common Law, Civil Law and Indigenous legal traditions. The NLC Summer Program property law course can however be counted as an elective credit in the McGill BCL/LLB program. 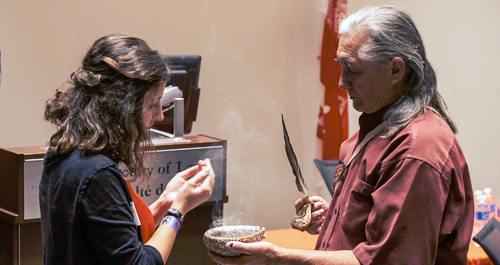 McGill's First Peoples' House provides a sense of community and a voice for Indigenous students who have left their communities to study at McGill. A “home away from home,” First Peoples’ House offers a mentoring program, computer facilities, guest lectures, elder visits, academic counselling, and an ever expanding resource centre as well as housing. Check out our FAQ related to the admissions process, LSATs and GPA requirements, as well as practical information about studying law.